This is Emily holding up the final dose of Doxorubicin she will have to endure!! 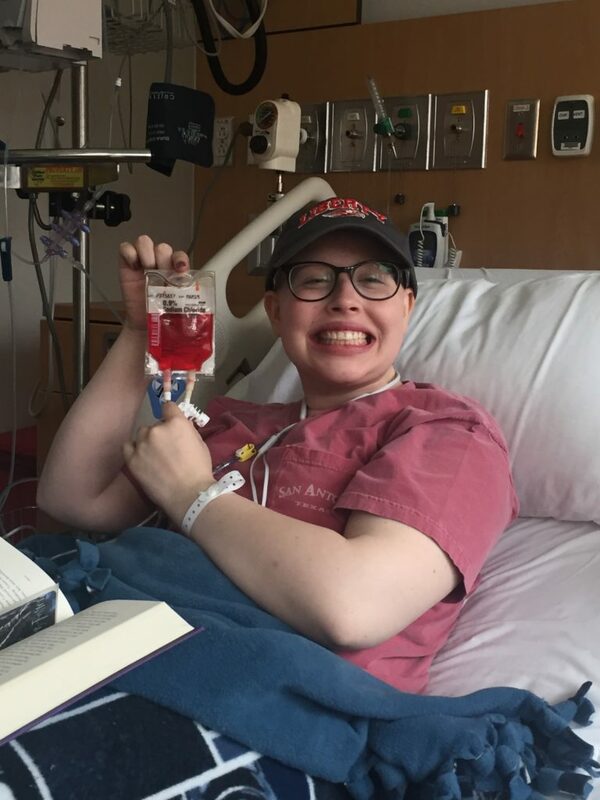 Since my last update, Emily has finished treatments #14 & #15! She has 3 to go. Round #14 finished on Sunday, July 29. It was another five day-four night stay! We are so thankful those have shortened to 4 nights the last several treatments! The goal was for her to start chemo #15 on Wednesday (8/1). But because of the mouth ulcers, they postponed her until Monday (8/6). So that puts us about a week behind… That isn’t terrible. We were praying for three weeks in a row, but three treatments in four weeks isn’t bad. Monday she had her labs (numbers were fine) and met with the oncologist. She has only one mouth ulcer left and it is healing so they will move ahead. She finished round #15 today (just after noon). It is a doxorubicin treatment, which is outpatient. It was two days in a row (Monday/Tuesday) but she came home each night! This is her second and last outpatient treatment. She only gets doxorubicin by itself 2 times and this is the second time. Heavy fluids aren’t required. So she was at the hospital Monday for most of the day and today for a few hours. So as of today (8/7) – she is done with her final outpatient chemo! Another milestone! Typically, she will feel bad for about a week and slowly get better over the next week. 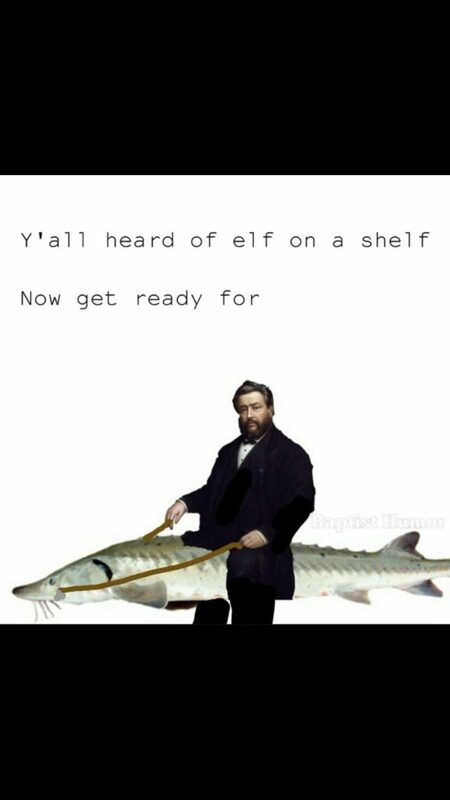 it isn’t as bad as some other treatments. She just feels “off” – something not right with her body. So it will be a lot of resting and sleeping. She has about 13 days for her body to recover until the next treatment. Likely, her next chemo will be scheduled to start 8/21 (if her numbers are good). That will begin her last three weeks of chemo! Three treatments left. All methotrexate treatments. The biggest news for our family this week is that Morgan will leave for college this Saturday. We are thankful that Emily was able to begin this third week of chemo with basically a six-day delay. 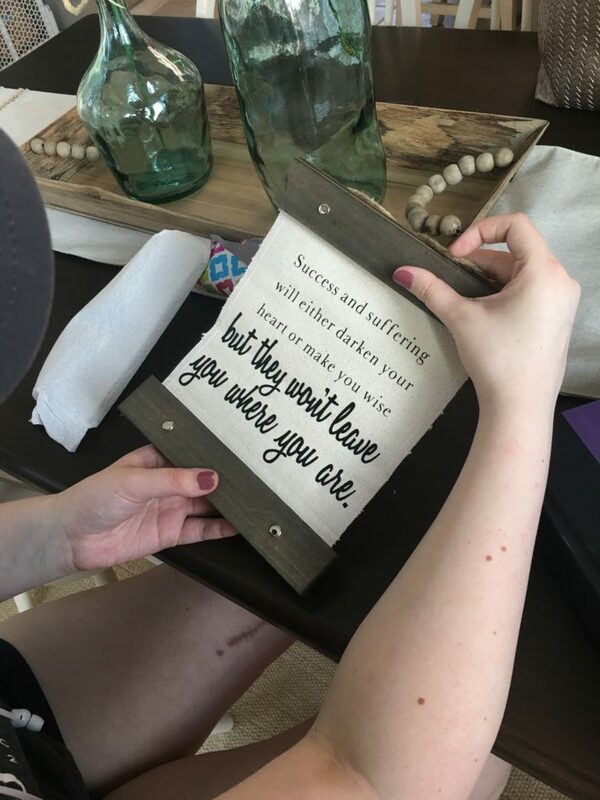 We are so thankful Morgan being home this summer. She brings great joy to our home and lives. We couldn’t be more thankful for her and that she was home all summer. 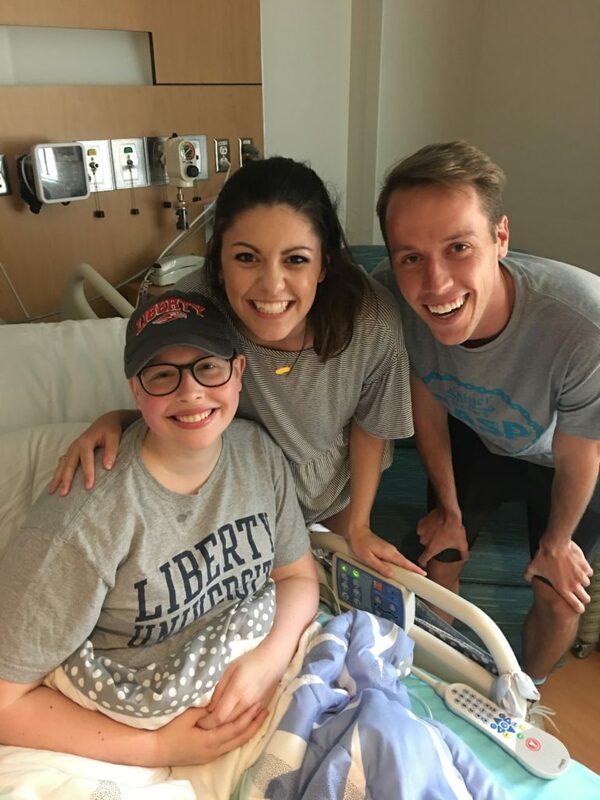 The church where she served has offered her a job for this fall, but she decided to go back to Liberty for her last year. We continue to thank God for Emily’s growth and great attitude through all of this. Emily still hasn’t thrown up for the last four or five treatments now!! That is a huge praise for Emily! It seems they have figured out the meds that keep her from throwing up. She still feels very sick but not throwing up is a huge priority for her. We are thankful for those meds! Emily has registered for college classes online. 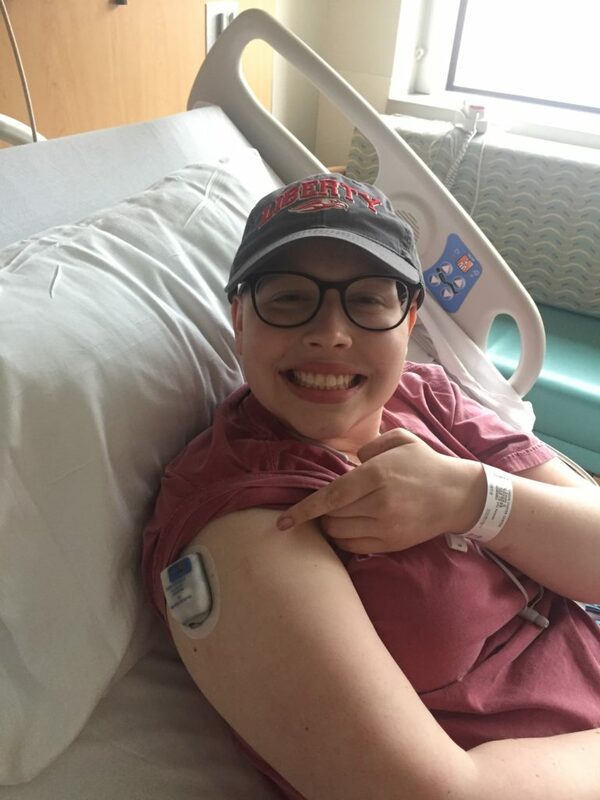 She won’t be done with chemo in time – so she will be an online student this next semester. Although we had wanted to avoid that, we are thankful that she should be able to do classes – although the first few weeks will be tough. Emily and Sue plan to head back to Rochester for a bridal shower for Ali in September. Pray that the timing can work out to get Emily there and that her counts are strong enough to go. Please pray that Emily can start her next treatment on time (8/21). Pray that Emily would be able to walk without a limp within six months from surgery (mid-September). She has been walking more often without a crutch, but with a very strong limp. She is getting closer! 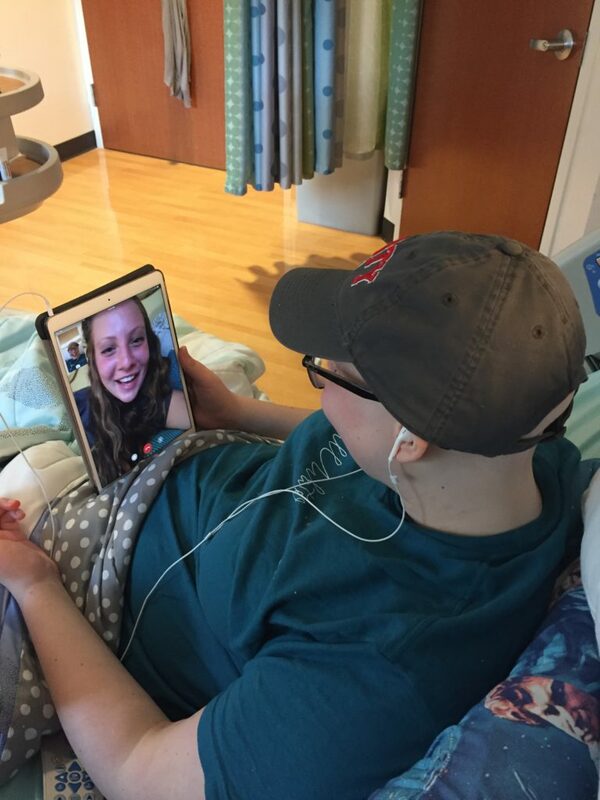 Toward the end of her inpatient chemo treatments, Emily feels better and loves to connect with friends via FaceTime. I was assigned to a church near Syracuse. 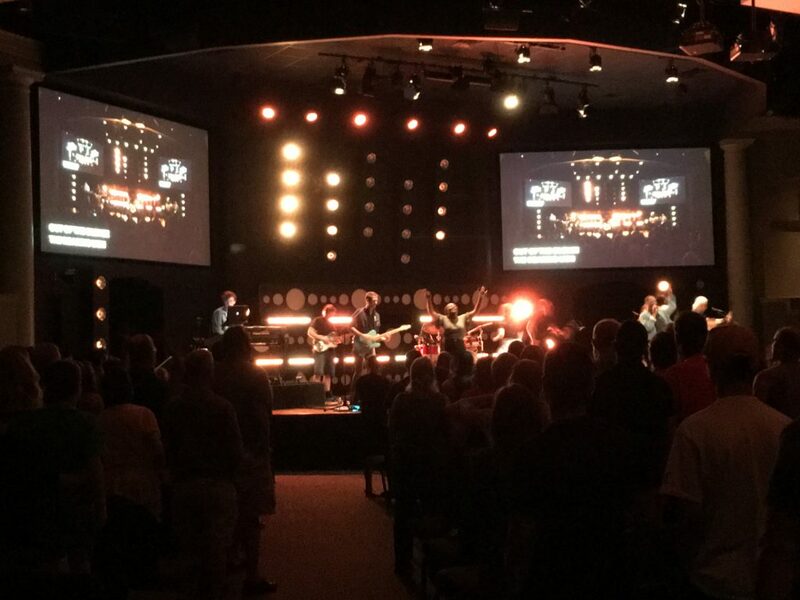 So after meeting with the church all day on Sunday, I was able to attend the Night of Worship at Northridge! It was great to be able to visit the church again and spend time with my oldest daughter, Ali. 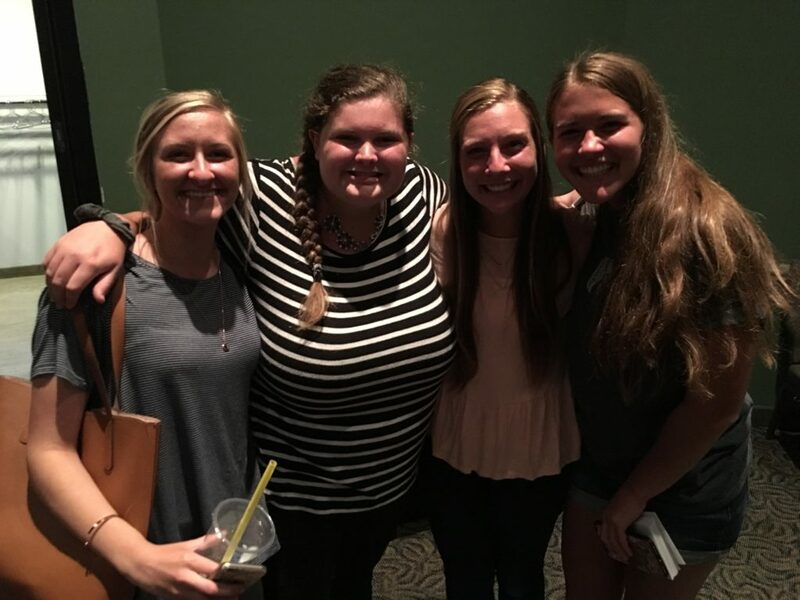 It was great to see some of Emily’s best friends from Rochester at the Night of Worship. During the last methotrexate round, one of my co-workers, Timber, came with her boyfriend to visit Emily. She wasn’t quite feeling up to playing a game but it is nice to have co-workers who don’t know Emily care for her and our family. 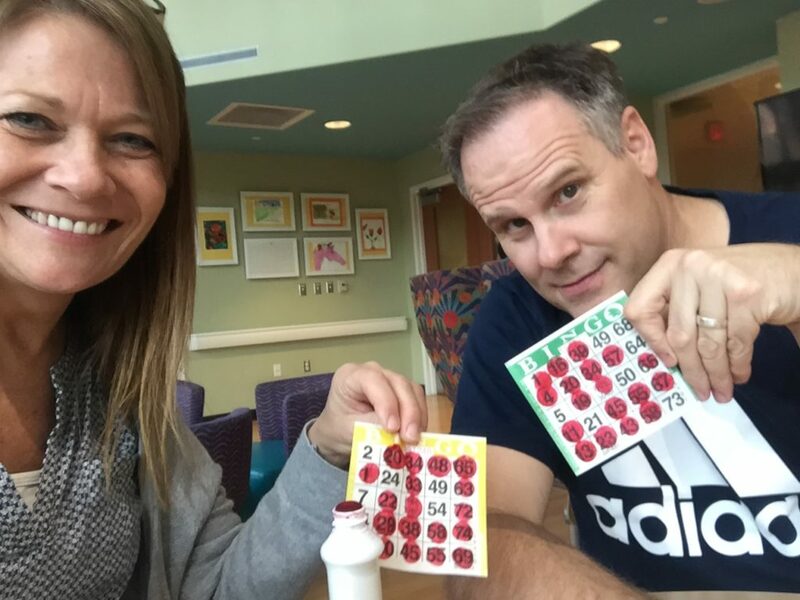 Every couple of weeks they have Bingo in the pediatric wing. 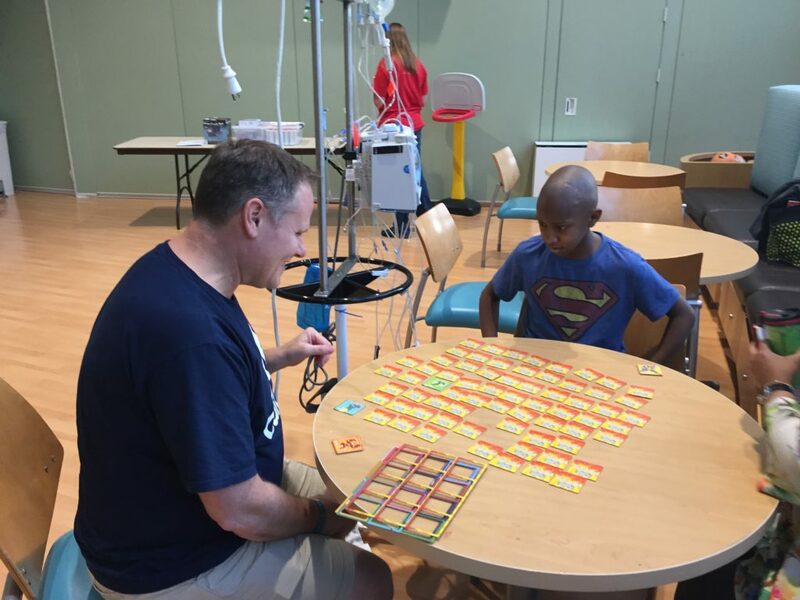 Patients and parents come and play Bingo and they have prizes. Sue makes me go. They play all types of Bingo (I didn’t know there were options). When I won, I gave my prize to this boy. It is a Superheroes matching game. So I asked him to play a game with me. He crushed me. He is here from Kuwait fighting cancer. 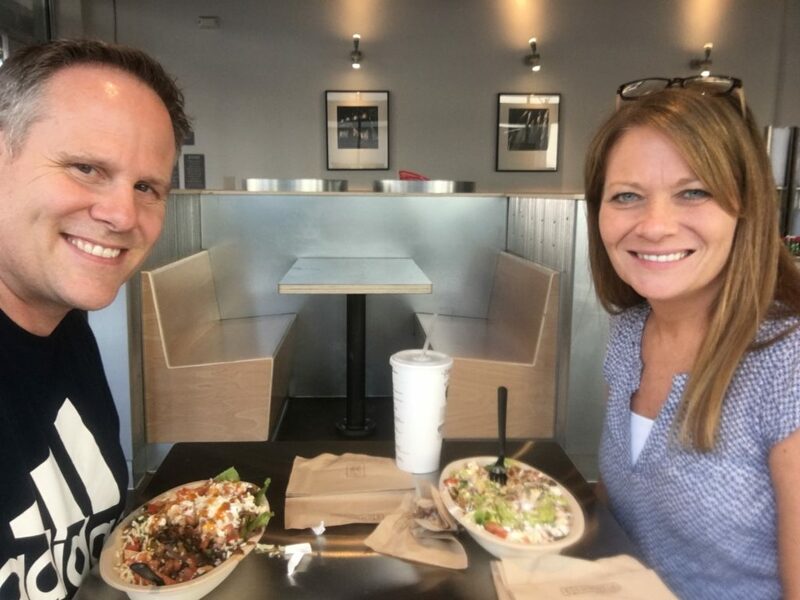 We end up eating a lot of meals at Chipotle. We can walk there from the hospital. We are thankful there is one close by. Between treatments we were able to have Daisy’s buddy, Jonesy, over for a few days while his owners (Sue calls them parents) went away on a trip. 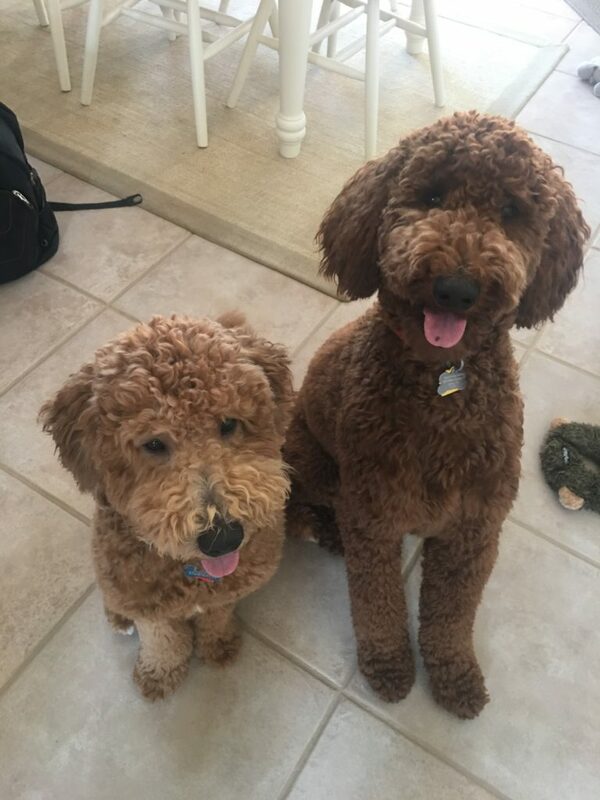 They have helped us with Daisy a lot – so it was nice to return the favor – even though it was only 3 days. 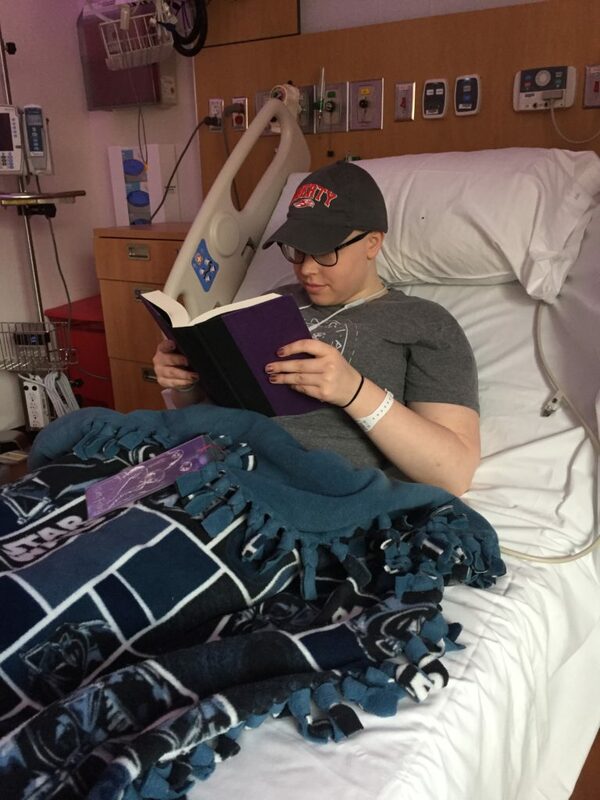 On Monday, as Emily waited for the chemo to start, she is feeling fine, she was able to read. The red line you see is the chemo. it only takes 15 minutes to get into her. 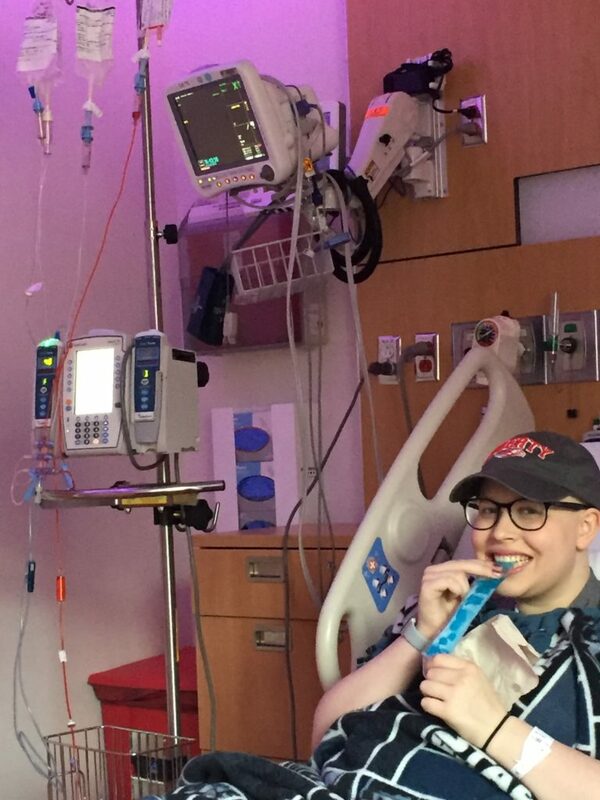 As her mouth sores are healing, she likes to eat ice pops (or whatever they are called). She started to feel sick Monday and will feel “off” for the next few days. The final bag of doxorubicin ready to go! They sent Emily home with this Neulasta “patch.” It gives her a shot 27 hours after the chemo was finished. It is used to increase her white blood cells and decrease the chances of infection. Praying for you all – thanks for the update.